Pots of Paint is an established business dedicated to giving you the best possible customer satisfaction. 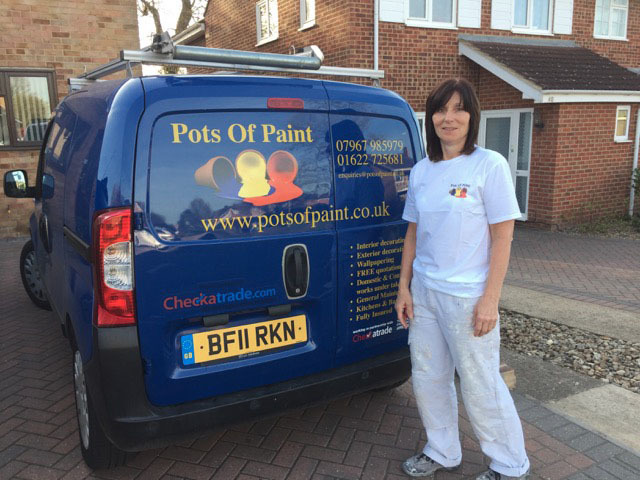 Pots of Paint have a team of highly skilled and fully qualified lady decorators with years of experience in painting and decorating. We are located near Maidstone in Kent, and provide a painting and decorating service to homes and offices in Tonbridge, Tunbridge Wells, Sevenoaks, Maidstone, Paddock Wood and all over Kent and East Sussex. Prices are normally per project, although we are happy to work on a day rate or even an hourly rate at the request of our customers. All quotes will include a detailed list of all works to be carried out. We can include both materials and labour or labour only if the customer is happier to purchase their own paints due to colour preference. Quality products are used such as Johnstone’s, Dulux, Crown, Farrow and Ball, and Fired Earth. We are happy to help you to choose a colour scheme and can provide you with an extensive colour chart to help with the process. We are only to aware that in some cases the rooms to be decorated cannot be fully cleared prior to us starting any works. We will be more than happy to assist on moving some furniture on the day of arrival and/or to cover any pieces of furniture in order to protect them.